Koh Phi Phi must be the Thai island that has the worst reputation. Or the best, if you love partying. Some people will tell you it was worth it 25 years ago but that the island has been ruined by tourism. Unfortunately, I can’t say that it’s not true: every inhabited part of it is basically a holiday village to itself, packed with hotels and restaurants. 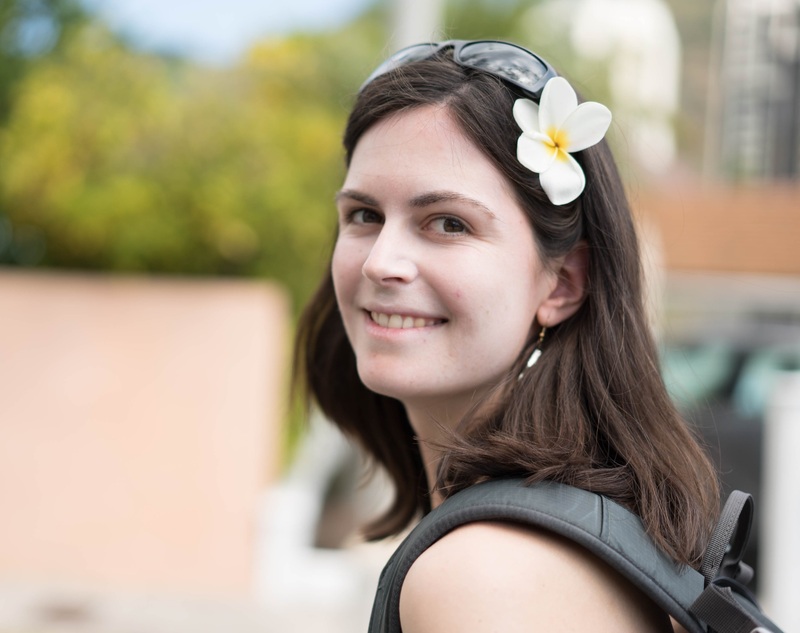 It’s definitely not the right place to go if you want to discover Thai culture. But 25 years ago, I was 2 years old and I’m not sure I would have been able to enjoy any of it! So should we have just skipped it? I’m happy we didn’t. More than the heavy touristic activity, what we really didn’t want to be part of was all the partying that Koh Phi Phi is famous for. I’ve heard stories involving buckets of alcohol and ropes in fires among others. If it’s how some people have fun, that’s fine but it’s just not our thing. With all of that in mind and our low expectations (and that’s probably why we ended up liking it so much), we were determined to have a good time and to enjoy the Phi Phi islands beauty. Tonsai is the main town of the island, where the pier is. 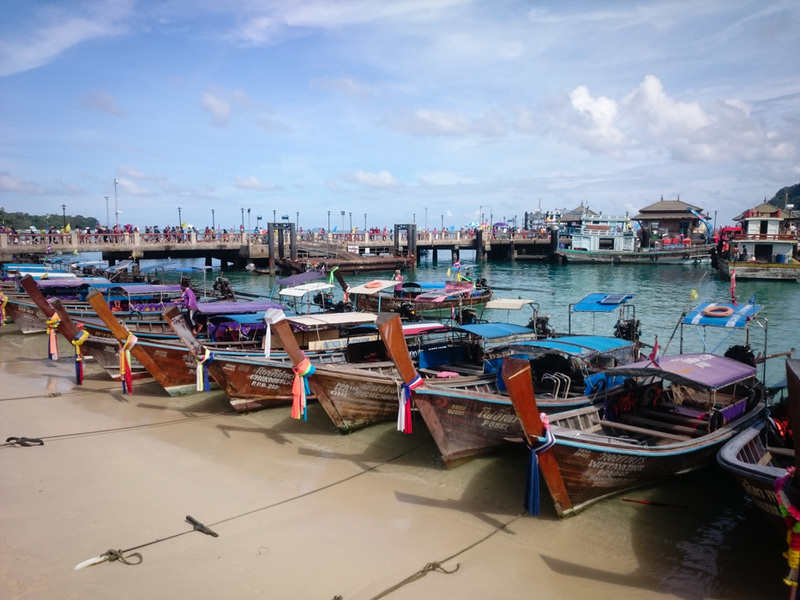 The sea front is lined with long tail boats and speed boats allowing a constant flow of people arriving and leaving. The village itself is crowded as well. We spent a few hours there (which is more than enough to see it all) and I felt very overwhelmed. Long-tail boats… and lots of tourists in the back! Tonsai hotels are not the only option though. We stayed on the North East coast at Ba Kao Bay resort, a very impersonal, not great yet not horrible hotel that is just a few minute-walk away from the beach. The bay in which it is located, Loh Ba Gao bay, is simply gorgeous and much quieter than Tonsai. There was a small village between the hotel and the beach with some restaurants and a few convenience stores. The bars were playing music at night which gave some animation but there was no crazy partying going on and above all, the hotel was quiet. During the day, most people go to Tonsai or out on day trips so it was all very calm and relaxing. The beach of the bay was also a perfect spot to avoid the crowds and enjoy the clear water and beautiful scenery. 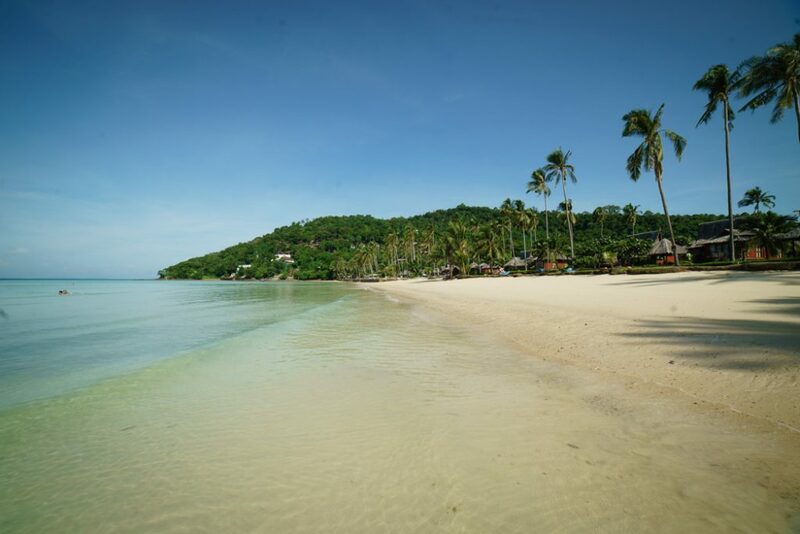 I’ve heard that the beach is private and belongs to Phi Phi Island Village hotel (which I wish we could have stayed at but it was probably not the same budget!) but we went several times and never got kicked out. 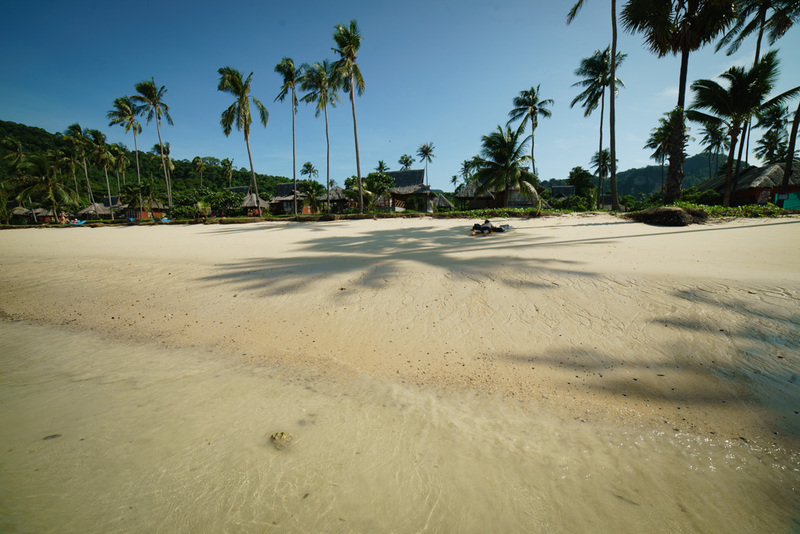 If you want a beach to yourself in the area, head to Loh Lana bay beach. We went once and it was completely deserted… ok that’s not the whole story. Several locals recommended we go to Nui Bay (we eventually never made it) which is accessible through Lana Bay when the tide is low although it’s also very beautiful when the tide is high. 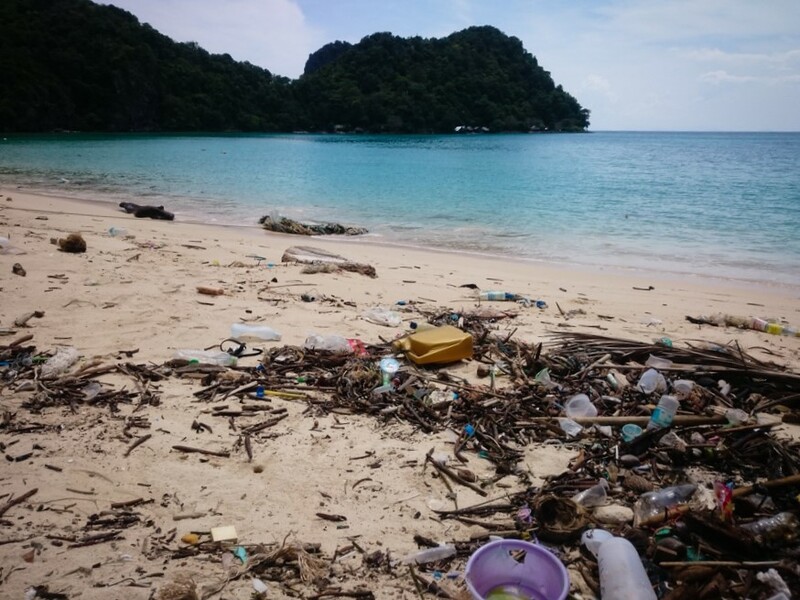 We went at high tide and did find a very beautiful view… but we were not able to go past the piles of rubbish all along the beach and in the water. Do I need to say we didn’t stay?! Staying outside of Tonsai requires a little bit of organisation though. Usually these remote hotels are only accessible by boat and will offer shuttle boats to Tonsai. In our village, there was also no ATM (and don’t count on using your credit card there). But we thought it was a small price to pay and we were happy with our choice. Low season in Thailand is from May to September and we were in Koh Phi Phi in the end of July (I even got to spend my birthday there!). We saw a crowded Tonsai already so I can’t imagine how it must be during the high season. Is it even possible to find a hotel room without booking three months in advance? Not to mention everything becomes more expensive then. If you’re worried about the weather during low season, I can tell you it’s not that bad. Sure, we didn’t have a pristine blue sky every day, but we were able to go snorkelling without any visibility issues. There was only one day out of a week when we had a couple of rain showers, although the storms were nice enough to wait until the middle of the night (another bad point for our bungalow’s very very noisy roof…). Although there is not much more to do but to wait for a storm to pass, isn’t it the best to jump in the water when it’s only raining, when the water is warmer than the air?! If it doesn’t sound too appealing, you can always get a Thai massage until the rain calms down. Loh Ba Gao bay, late July – The weather doesn’t look so bad, does it? 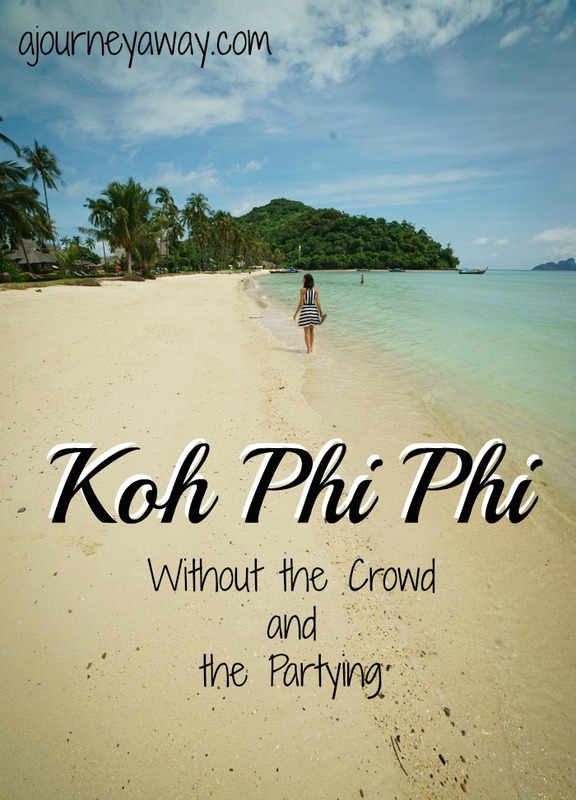 It’s all about beating the crowds on Phi Phi island. Our hotel offered only two free shuttle boats to Tonsai per day (7.30 am and 11 am) as well as two to come back (10 am and 3.30 pm) which we thought was very restrictive at first. 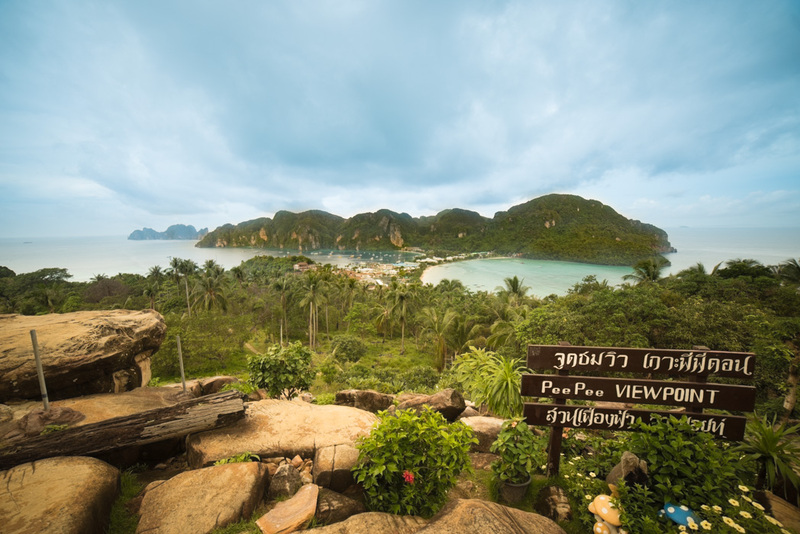 On our first day, we hopped on the first shuttle with the objective of going to Phi Phi viewpoint. We headed there after having some breakfast, with no rush and arrived at about 9.30 to find only two or three other people. The view is so pretty that we stayed for a while, but more and more tourists arrived and at 11 am, it was already not so enjoyable anymore so we left. Since we had some time before catching the shuttle back to the hotel, we went to Loh Dalam bay beach. Of course, we were far from being the only ones on the beach and quickly noticed people with a drink in the water and other parties starting as early as 1 pm. Likewise, if you book a day trip, choose well. When we were looking for a tour to explore Koh Phi Phi Leh, we realised that all the guides offer the same thing. We eventually went with a guide who wouldn’t take more than six people on the tour and would leave 1h before all the others in the morning. Thanks to him, we were able to see Pileh Lagoon with only one other boat there. This place is simply magical and I felt privileged to see it deserted knowing how many boats were visiting it during the day. Yes Koh Phi Phi is highly touristic and yes, it was probably more quaint 25 years ago. But we had the opportunity to go now and we are far from regretting.